You don't go into a Night Ranger show expecting a lot of surprises. The band hits the stage with a deep catalog of hits at their disposal, and that's what they deliver, with few new tunes or unusual choices mixed in. The Bay Area rockers are the very definition of meat-and-potatoes American rock — hard enough to appeal to the "rock dudes," poppy enough to soundtrack decades of high-school reunion slow dances. While predictability might be a detriment for many music experiences, it's a highly valued commodity among the so-called "legacy acts" still on the road. Nothing is more frustrating for fans than going to see a long-time favorite and the singer can no longer, you know, sing. Or for fans to show up and the only recognizable member of the band is the bass player (no offense, bass folks). 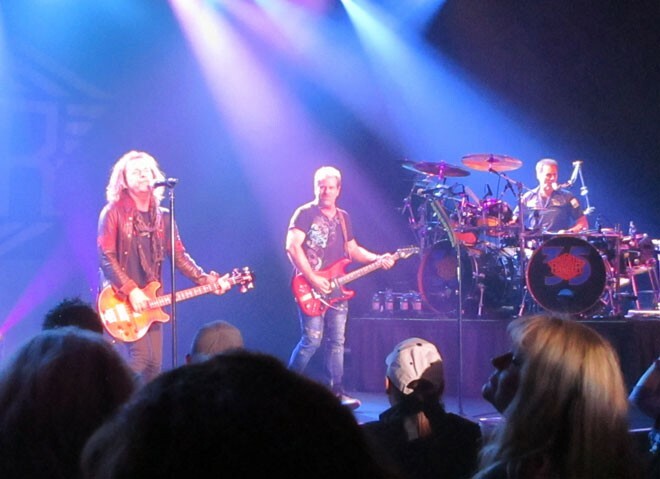 Night Ranger is pretty high-quality when it comes to these kind of gigs. I've seen them twice in my life, both long after their '80s MTV- and radio airwave-hogging heyday. And both times they band's been rock solid. From left: Jack Blades, Brad Gillis and Kelly Keagy started Night Ranger together in 1982. For that you can mostly thank the trio who formed the group in 1982 and who are still leading the charge: bassist/singer Jack Blades, guitarist Brad Gillis and drummer/singer Kelly Keagy. 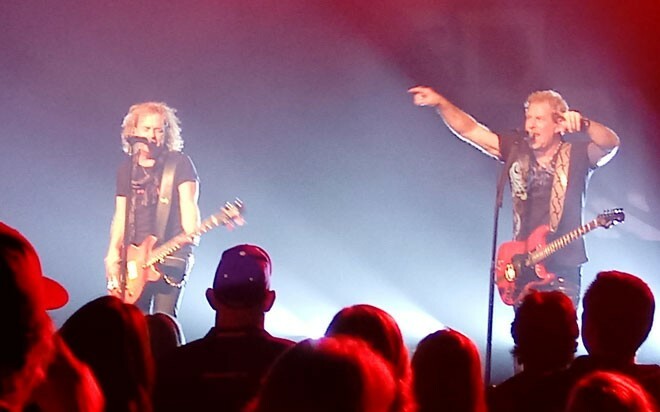 Abetted by keyboard player Eric Levy and second guitarist Keri Kelli, Night Ranger nearly sold out their show at Northern Quest Resort & Casino Thursday, and delivered exactly what the people wanted. Did we get the harder-rocking tunes like "Don't Tell Me You Love Me" and "You Can Still Rock in America"? You bet we did, the latter tune closing down the show after 90 minutes. Did they rattle off the monster video hits that took them from being a new band to arena headliner? Indeed they did, knocking out "Four in the Morning" early on, and the monster acoustic-fueled power ballad "Goodbye" toward show's end. And yes, "Sister Christian" was a massive singalong as the show's penultimate performance, and the band's knockoff of that tune, "Sentimental Street," was rapturously received by an audience that largely stayed on its collective feet throughout. 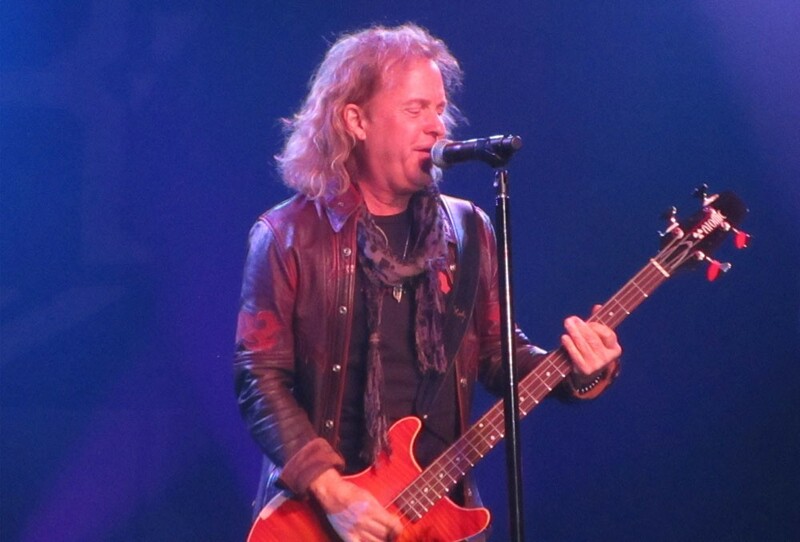 Night Ranger's Jack Blades (left) and Brad Gillis, two of the band's founders. Surprises? Maybe a few small ones, in the sense that I didn't expect them to do some songs Blades first wrote as a member of Damn Yankees, not Night Ranger ("Coming of Age," "High Enough" and "Come Again"). And I'll cop to the band's soundtrack theme from Michael J. Fox vehicle The Secret of My Success to being a guilty pleasure, so that was a treat. The band opened the show with "Somehow, Someway" from their 2017 album Don't Let Up — maybe it's a surprise that it was the only new tune to make it into the show as far as I could tell. Mostly, though, it was a Night Ranger show that would have been familiar at any point between the '80s and now. Blades still sounds great, Keagy's voice is a little less strong, but he had the crowd help him out while he bashed away at his kit. The muscular Gillis is still striking the primo rock poses he did as a kid. This gig was part of Night Ranger's 35th anniversary tour, and they're still acquitting themselves very well as a live band. That might be the biggest surprise I walked away with Thursday.